A team of young architects and urbanists  Izabela Cichonska, Nathan de Groot, Lindsay Harkema and Ondrej Janku  has been awarded first place in the Tallinn Architecture Biennale 2013 Vision Competition, Recycling Socialism. The Centre of Estonian Architecture received 86 competition entries. The jury – Bjarke Ingels (BIG), Inga Raukas (Allianss Architects) and Endrik Mänd (Chief Architect of Tallinn City) – decided to give the first prize to the competition entry Assembled Ground by an international team of young architects: Izabela Cichonska, Nathan de Groot, Lindsay Harkema, and Ondrej Janku. 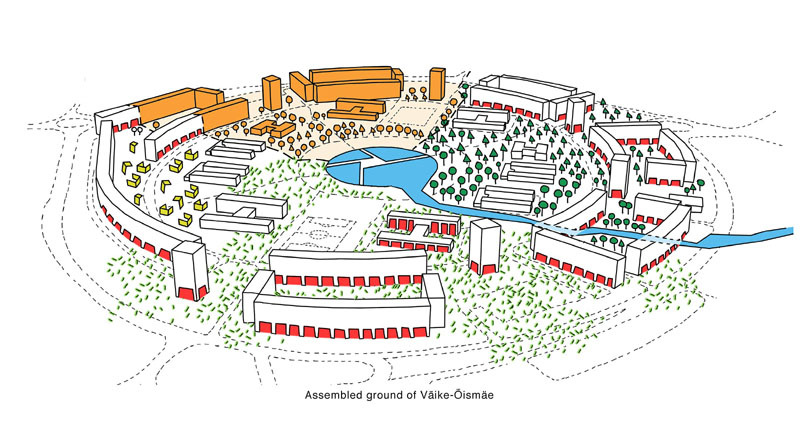 Challenged to propose a scheme for urban remediation that could diversify the concentric plan of Väike-Õismäe  one of Tallinns three larger Soviet-era panel-apartment districts  to enhance quality of life, Assembled Ground envisions a radical plan that would reactivate the sleeping district by recharging the ground. The jury: "This project stood out for its essentially simple and well-demonstrated idea  to open up the ground floors of the apartment buildings, together with the central area, and to make them available for public use. The removed facade panels as well as the buildings constructions and frames will be recycled. […]The authors of the winning entry highlighted the lasting values of the Väike-Õismäe plan, and offered a clever strategy for creating a new environment and space, which is possible to carry out and execute graduallyeven (at least partially) over the course of the upcoming decade. Starting off by changing the buildings ground level was the clearest idea, the execution of which would have an immediate effect on the entire surroundings, and would complement the unique architecture of the apartment district in a simple way."